We started our little company in 1975 with a clear vision - to create a unique and handcrafted line of personal expression products that would encourage and inspire heartfelt communication. 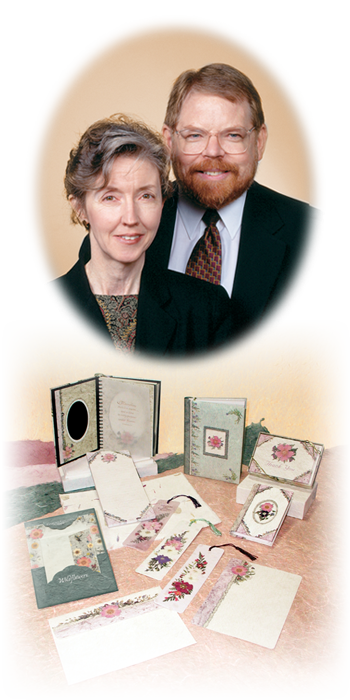 Over the years, our company has grown, and created exclusive products crafted with real pressed flowers and natural handmade paper designs. We continue to develop new products and designs that address the personal need to express our feelings. Whether you are looking for gift cards, stationary, bookmarks or even magnets, we offer a wide variety of charming gifts and supplies for everyone. If someone in your life is celebrating a birthday, or you want to send a gift for an upcoming holiday, you will find the perfect gift that expresses your feelings to a tee. So feel free to browse through our extensive collection of floral treasures, you are bound to find a perfect gift for any occasion. On behalf of all of us at Creative Graphic Floral Gifts, we would like to personally thank all of our loyal customers who are helping us to fulfill our vision. We look forward to many more years of creating designs and inspirations!